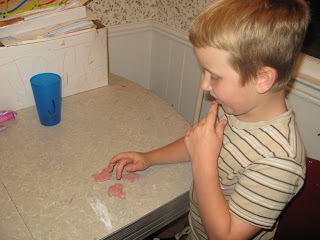 Joel got the idea to chew his way around a piece of Spam to make figures. We call these Spam Creations. If I can ever get my crap together, there's a video that goes with this where he's describing each creation. That's a homeschooled kid for ya ... hahahahahaa!!!!!! I don't know if this is a good thing or not.